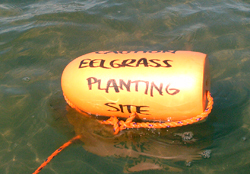 Eelgrass is planted using one of two methods: transplants (adult shoots) or seeds. 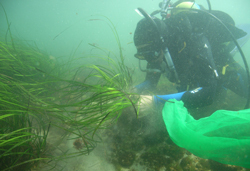 Adult shoot work normally involves harvesting plants from an existing meadow and transplanting them to the restoration site as there is no readily available source of nursery grown eelgrass. In most cases, some means of anchoring the shoots to the bottom is necessary until the roots can take hold (root into the bottom). Seeding involves hand, or in some regions (e.g., MD & VA) machine, harvest of mature reproductive shoots from natural meadows and holding them in flowing seawater tanks until the seeds are released naturally. In the fall, the seeds are broadcast. A new method developed at CCE and described below involves deploying mature reproductive shoots directly in the field for seed release, eliminating the need to have an onshore facility. Rather than focus on any particular planting method, we use all of the methods described below in our restoration work. In this way we are able to work throughout most of the year and can take advantages of the benefits each method has to offer. However, not every method will work at every site. 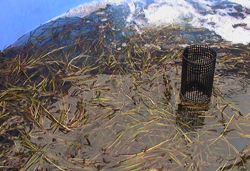 The most common, and to date, most successful method of planting eelgrass on the east coast of the United States involves transplanting adult shoots. There have been numerous methods developed, all having one common goal: anchoring a viable shoot in place long enough for the roots to emerge and hold the plant in the bottom. The most common source of adult shoots is from existing/extant meadows and in most cases the plants are pulled by hand or dug from the meadow using a shovel. Here on LI we try to minimize impacts to the remaining meadows and have come up with two alternatives to digging in natural meadows. The two main sources of adult shoots we use at CCE are free-floating and beach cast shoots and shoots gathered from the eroded edges of existing meadows. 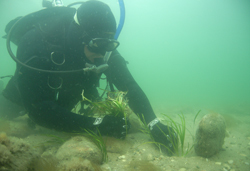 Large amounts of viable eelgrass plants with rhizome and roots intact wash up on local beaches as wrack resulting from bioturbation, strong waves, and shellfishing activities. 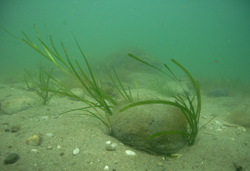 Collection of these "beach cast" shoots for restoration purposes is a low-cost and low-impact source of eelgrass transplants. In most cases, these plants are transported to our nursery greenhouse to be held for a week or more before planting. During this time, damaged shoots can be identified and discarded. 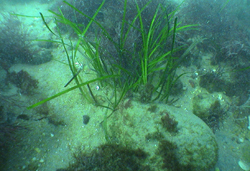 A second, more reliable method of collecting eelgrass shoots involves collecting plants along the fringes of eroded beds. In our experience, there are several meadows around Long Island where wave energy scours out long and narrow breaks in the meadow parallel to shore. It is on the shoreward facing side of these openings where plants are actively uprooted by the combination of wave energy and crab burrowing. Here, large numbers of viable plants can be collected that would otherwise end up drifting onto the adjacent beach or out into the open water. In some cases we do rely on collection of small numbers of shoots from extant meadows if we need to have a specific source of plants for our planting purposes. When this is necessary, we randomly collect over a broad area and focus on the edge of the meadow so as not to create any instability in the interior of the meadow that could lead to loss of additional plants. Although in many cases it is necessary to anchor shoots in place using one of the various methods devised, we have found that in some cases it is possible to simply push the rhizomes into the sediment. 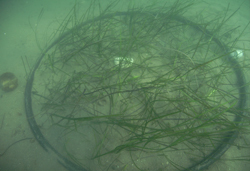 In moderate to low energy sites, unanchored freplanting has been successful in establishing eelgrass. Plants are pushed into the sediment with the rhizome deeper than it would normally occur and at an approximately 45 degree angle. Both of these conditions are artificial, but they are necessary in order to keep the plant in the bottom until it becomes sufficiently rooted. When planting using this method, we typically establish a defined area on the bottom using a circular ring or stakes and plant a specific number (typically 200 shoots/m2)of plants within that area to achieve a desired density. A numbered rock is normally left in place at the center of the planting to ensure future relocation, even if the plants have been lost to erosion (see photo). A modification of the above free-planting method has been developed here at CCE for the high energy environment of the Long Island Sound and some exposed areas in the eastern Peconic Estuary. In these areas, we have used available rocks to hold down small groups of adult shoots until they become rooted. The rocks are lifted from the sediment and the shoots are simply placed in the depression created by the rock and the rock is put back in place. Typical rock planting involves placing between 3 and 10 shoots under a grapefruit-sized rock. Smaller and larger rocks have been used successfully. This method does not appear to have any adverse affect on the growth of the plants, and in a short time, the shoots root into the sediment and grow away from the rock. 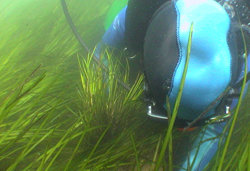 One method we have used which was developed at the University of New Hampshire is known as TERFS (Transplanting Eelgrass using Remote Frames System) (Burdick and Short 2002). 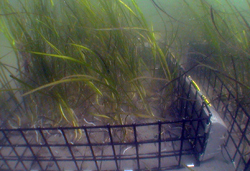 In this system, eelgrass shoots are attached to a mesh metal frame using biodegradable paper "string". 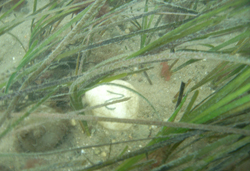 The frame is then placed on the bottom where eelgrass shoots are able to take root as the string biodegrades over time. TERFS are placed side by side underwater to create a large grid. 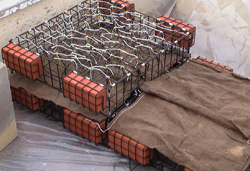 The frames must be pulled from the bottom after the plants have begun to take root in the sediment, yet haven't had enough time to grow over and through the mesh frames. Regardless of the eventual method of planting, all seeding methods require collection of seeds from natural meadows. 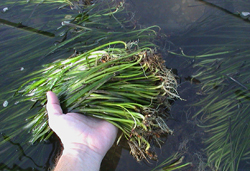 During the summer months, eelgrass flowers produce seeds (learn more about flower and seed development in the eelgrass Life History section). These reproductive shoots are harvested using SCUBA [or snorkel] gear and by grasping and pulling the shoot away from the rest of the plant. As discussed in the Life Historysection, these shoots will die after flowering, so there is no damage to the plant in removing the flowering shoot. Flower shoots are brought back to our greenhouse laboratory where the seeds develop fully and are released from the remaining flower. Once seeds are released, the flower shoots die and begin to decay. Seed processing involves separating the decaying flower shoots from the developed seeds through a series of sieves. 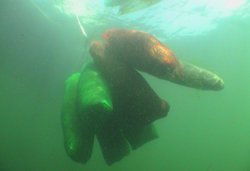 Once separated, the seeds are kept in separate holding tanks according to their original habitat, and are counted volumetrically. 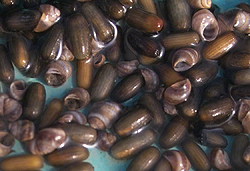 Distribution of the seeds occurs in early fall by broadcast seeding via boat or by wading through the water, depending on the site. Seeds are spread at sites which have the best corresponding conditions with the original site where the flowers were harvested, and the amount of seeds to be used for a site is determined by the desired density (shoots per m²) for that restoration area. Seeds can also be grown out in flowing seawater tanks and then planted out at the desired site when plants reach an optimal size.